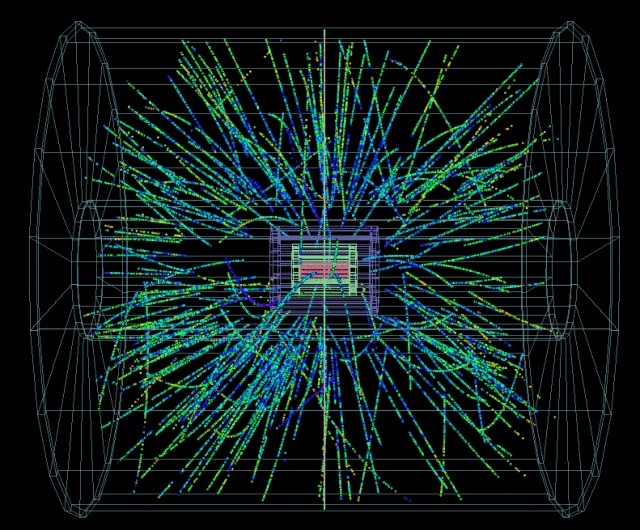 “The ALICE experiment is dedicated to the study of the quark-gluon plasma. Each year, the LHC operates for a few weeks with lead ions instead of protons. ALICE collects data both during proton-proton collisions and heavy ions collisions. Even when only protons collide, the projectiles are not solid balls like on a billiard table but composite objects. By comparing what can is obtained from heavy ion collisions with proton collisions, the ALICE physicists must first disentangle what comes from having protons in a bound state inside the nucleus as opposed to “free protons”. So far, it appears that the quark-gluon plasma only formed during heavy-ion collisions since they provide the necessary energy density over a substantial volume (namely, the size of a nucleus). Some of the effects observed, such as the number of particles coming out of the collisions at different angles or momenta, depend in part on the final state created. When the plasma is formed, it reabsorbs many of the particles created, such that fewer particles emerged from the collision. By colliding protons and heavy ions, scientists hope to discern what comes from the initial state of the projectile (bound or free protons) and what is caused by the final state (like the suppression of particles emitted when a quark-gluon plasma forms). A “snapshot” of the debris coming out of a proton-lead ion collision captured by the ALICE detector showing a large number of various particles created from the energy released by the collision. The ultimate goal is to study the so-called ‘structure function’, which describes how quarks and gluons are distributed inside protons, when they are free or embedded inside the nucleus.